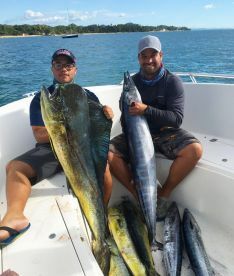 If you’re looking for world-class fishing just a stone’s throw from town, Tarpon fishing Puerto Rico has to be on your bucket list. 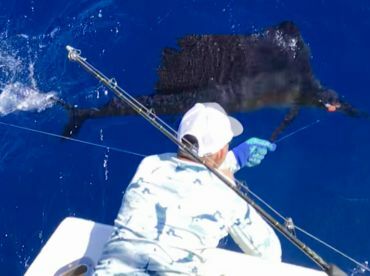 The “Silver King” rivals even the mighty Blue Marlin in the hearts of local charter captains and it’s easy to see why. These scaly freight trains can be caught year-round in the island’s murky lagoons. Time your trip right, and fish over 150 lbs are a real possibility! The great thing about Tarpon in Puerto Rico is that you don’t need to travel far to find monsters. 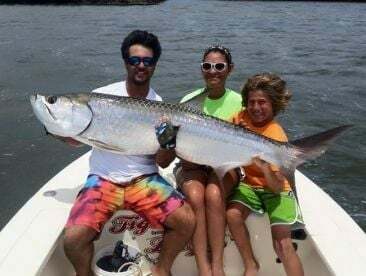 San Juan Bay is the island’s biggest and best Tarpon hotspot, and it’s right in the middle of town! You will usually be fishing in the Torrecilla and San Jose Lagoons, hitting deep holes left over from dredging in the ‘60s. These are Tarpon magnets. And if the first spot isn’t hot, you just hop over to the next one and try again. 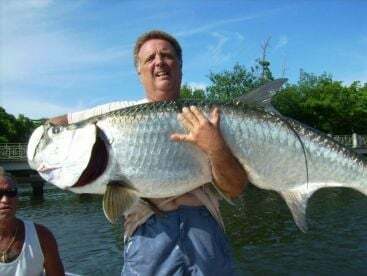 There are two main seasons for Tarpon fishing in Puerto Rico. Smaller, schooling Tarpon flood the lagoons October through December. By January, the big boys show up, starting a solid 5 months of epic battles against some of the toughest fish you’ll ever fight. Live baits and lures are both popular on local Tarpon charters. 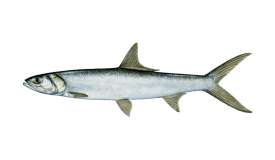 The top bait fish are sardines, mullet, threadfin herring, and anchovies. Live baiting work great in the morning, but dead baits fished on the bottom can be just as effective as the water warms up. Different guides will swear by a literal boatload of different lures, from hard-bodied jerkbaits like Yo-Zuri Sashimis and Jointed Crystal Minnows to soft plastics like D.O.As and Slug-Gos. 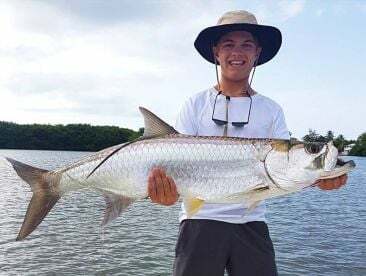 Fly Fishing is an obvious must for many Tarpon lovers. Clouser Minnows, Deceivers, the infamous Black Death––the waters are almost always cloudy, so dark colors are key, but other than that you can take your pick. You can find fish from 15 lbs to 150 lbs swimming around next to each other, so advising on rods and reels isn’t easy. Most specialist guides (and there are quite a few of them) stock a variety of weights which they will employ throughout the day. Puerto Rico’s urban lagoons are something every servant of the Silver King has to experience. The fish are bigger than you can believe, and pack into the holes that seem custom-built for incredible angling. 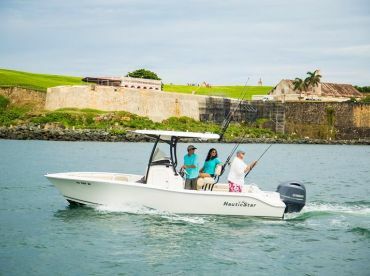 You’ll have the whole of San Juan as your backdrop, and a lifelong Tarpon fanatic for a guide. If you somehow manage to not enjoy it, we’d love to hear how! 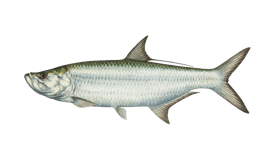 Tarpon fishing in Puerto Rico varies moderately throughout the year. High season is January to May. Low season is July to September. There is no closed season. 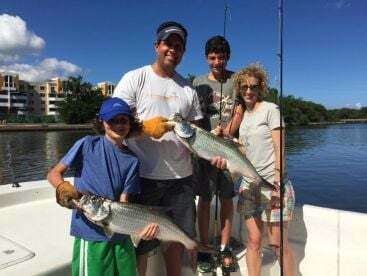 "Great day made even better with a Grand Slam"
"Rafa is a top notch guide"
If you’re serious about cathing Tarpon in San Juan, you need to book with Rafa. He’s puts in the work to find the fish, help you land fish and makes it an enjoyable experience all around. Rafa has one of the best work ethics I’ve seen and his results prove it.